This year’s Metrobank Foundation Outstanding Filipinos paid a courtesy visit to Speaker and former President Gloria Macapagal Arroyo last September 12, 2018 at the Speaker Social Hall, House of Representatives in Quezon City. The awardees were also honored at the Plenary Hall wherein the 17th Congress passed Resolution No. 2152, a resolution honoring and commending the Metrobank Foundation Outstanding Filipino of 2018. The Metrobank Foundation Outstanding Filipinos is a prestigious career-service award for Filipino exemplars in the academe, military, and police sectors. Guided by the theme of “Beyond Excellence”, a Metrobank Foundation Outstanding Filipino is recognized for rendering service above and beyond his/her call of duty. His/her accomplishments must have inspired and influenced their peers as well as the people in their respective communities. Their works must have transformed a community with a lasting positive impact on people and to the country. Teacher awardees are: (1) Mary Jane S. Ramo of Tonggo Elementary School (Tudela, Misamis Occidental); (2) Dr. Alma S. Janagap of Pavia National High School (Pavia, Iloilo); (3) Dr. Aimee Marie C. Gragasin of Philippine Science High School-Cagayan Valley Campus (Bayombong, Nueva Vizcaya); and (4) Dr. Carla B. Dimalanta of the University of the Philippines-Diliman (Quezon City). Soldier awardees, on the other hand are: (5) Lieutenant Colonel Francis A. Señoron PA of the Office of the Deputy Chief of Staff for Logistics, OJ4, Armed Forces of the Philippines, Camp Aguinaldo (Quezon City); (6) Lieutenant Colonel Thomas Ryan R. Seguin PAF of the 5th Fighter Wing, Basa Air Base (Floridablanca, Pampanga); and (7) Lieutenant Colonel Danilo T. Facundo PN(M) of the Marine Corps Force Development Center, Philippine Marine Corps (Taguig City). Police officer awardees are: (8) Senior Police Officer 1 Aida L. Awitin of Davao Occidental Police Provincial Office (Malita, Davao Occidental); (9) Police Senior Inspector Dennis S. Ebsolo of the Villanueva Municipal Police Station (Villanueva, Misamis Oriental); and (10) Police Senior Superintendent Pascual G. Muñoz, Jr. of the Directorate for Logistics, Philippine National Police, Camp Crame (Quezon City). Dr. Alma Janagap is an advocate of a culture of reading among students, believing it as the backbone of all wisdom and learning. As the English teacher and remedial adviser in Pavia National High School, she developed a school-based Reading Clinic—first of its kind in Region VI. The innovation eventually became a benchmarking model in the Division of Iloilo and has been replicated by 149 out of 179 schools. Her famous remedial classes have also extended through her immediate communities. Taking another shape through “Project Mind, Body and Soul” (MBS), Dr. Janagap personally visits houses in the neighborhood—where she does lectures on reading and writing skills, hygiene and nutritional needs, and building of spiritual character. Dubbed as the Philippine Navy’s Joint and Interagency Champion, Lt.Col. Danilo Facundo has championed initiatives upholding diversity and equal opportunity within the military and among the communities he has vowed to serve. During his stint as the Commanding Officer of the Marine Battalion Landing Team 4 in Palawan, Lt. Col. Facundo led various inter-agency interventions to combat widespread insurgency and terrorism in the province. By so doing, there was zero kidnapping and zero terrorism related activities in Palawan in the entire duration of his term. In his 28-year service, PSSupt. Pascual Muñoz, Jr. has proven himself exceptional both as a cop in the operational frontlines, and as an internal game-changer crafting policy changes to PNP’s internal woes. When he was the Director of the Laguna Provincial Police Office, he implemented new operational strategies to curtail pervasive drug trades and organized crime groups. In 2017, when he was lifted out of frontline duty to serve in the Camp Crame Headquarters, he did not falter in blazing trails towards the improvement of police services. He facilitated the conceptualization and formulation of policies streamlining service procedures for retirees and two support programs for a more transparent and expedient procurement of goods within the force. 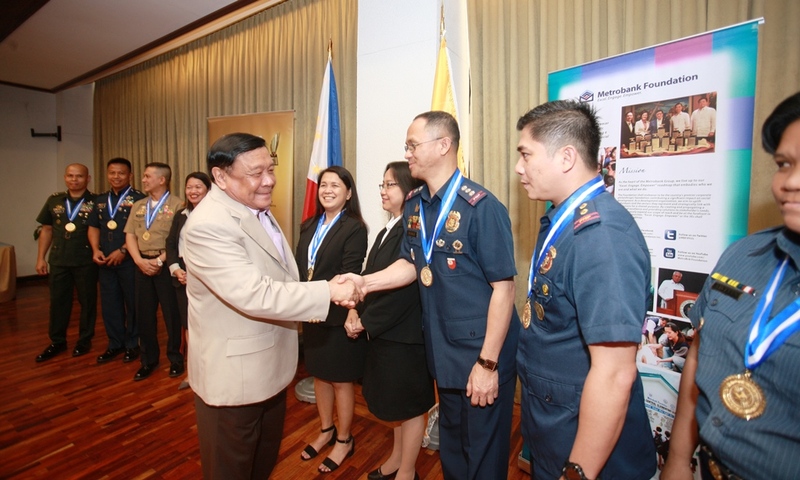 The awardees were chosen by the distinguished members of the Final Board of Judges chaired by Senator Angara and co-chaired by Supreme Court of the Philippines Associate Justice Noel Tijam. The other members include: Department of Justice Secretary Menardo Guevarra, Makati City Mayor Mar-Len Abigail Binay-Campos, De La Salle Philippines President Br. Armin Luistro, Philippine Business for Social Progress Chairperson Manuel Pangilinan, Rockwell Land, Inc. President & Chief Executive Officer Nestor Padilla and veteran journalist Ma. Teresa “Marites” Vitug. The 2018 Metrobank Foundation Outstanding Filipinos awardees received a cash prize of P1 million each, a gold medallion, and a trophy during the 56th anniversary celebration of the Metropolitan Bank & Trust Company (Metrobank) on September 7, 2018 (Friday) held at the Metrobank Plaza Auditorium, Sen. Gil Puyat Ave. Makati City.